Do you have white Christmas lights at your house? Well if you do, I just want to say I can feel your pain! And if you don’t, well let me just tell you what we went through at our house putting up our white lights. And to be honest it’s not the first time that something like this has happened ! So first things first. I’ve been busy with my soap so when the local nursery called to ask if we are getting some fresh garland a tree this year – I knew that it wasn’t going to be on my schedule so Daryl went to get it. I was really disappointed that I couldn’t go because I just love spending the time at this nursery. It’s definitely like stepping back in time and the owner is a lot of fun to talk to. He’s got kind of a gruff voice and with a thick Bohemian (?) accent, it makes an hour visiting just fly by! So now with the garland home, it’s time for the lights. I got out my box of ‘porch’ lights and it was time to see which ones worked and which ones didn’t. Now in all honestly why wouldn’t they all work? I have no clue – but that was the case! I grabbed my purse and said that I was just going to run to town to pick up another string so that they matched. It didn’t take me too long and while I was there I bought two boxes of the long lights. I thought that if the new strand of the right white didn’t match for some reason then we’ll replace the whole garland with new lights. And guess what? When we put the new one with the old one (which were both the same whites) they DID NOT match. So we took apart all the porch garland again and restrung the lights with the two new strings. Yay! Things were looking up because everything was matching at this time for the garland. 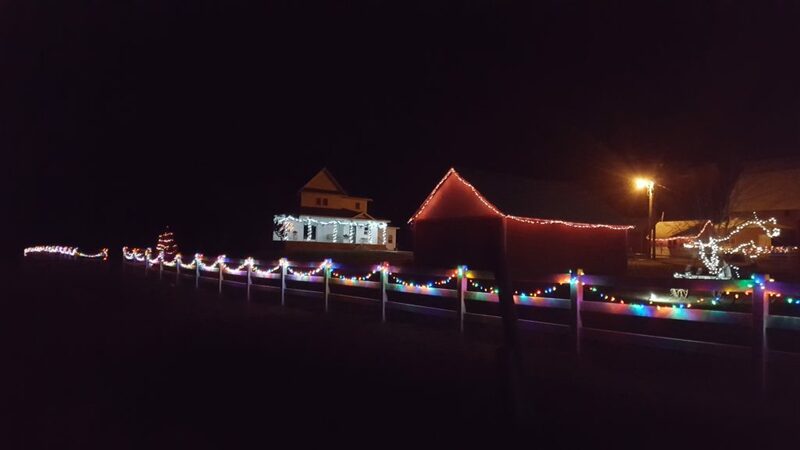 But after we took down the lights from the poles and restrung them with all new lights on the six poles- we finally had all the same color of white. Seriously who would have thought that this was going to be so complicated! And how do they look? I think they look great!